Some of us are burdened with lives of few hardships. Some of us are born to loving parents, have never experienced hunger, have access to quality healthcare and education, live in countries without war or unrest and have never had our rights denied by the hatefulness of others. We unfortunate few simply have had to learn to do without the luxury of obstacles. The best we can do is hope and fantasise – whenever we hear stories of true heroism – that we too, given the opportunity, could be so courageous. But then there are stories where no amount of self-delusion could grant such a fantasy. It’s a very unsettling feeling when you hear stories of people and you know immediately that they are much braver than you could ever be. If after hearing the story of Fawzai Koofi you do not find yourself in this position, then congratulations – you are a better person than me and in all honesty, you frighten me slightly. Initially rejected by her mother on the day she was born, Fawzai Koofi was left out to die in the Afghan sun. Luckily, at the last minute her mother had a change of heart and rescued her. When Fawzai grew up she persuaded her parents to send her to school, making her the only girl in the family to attend. She went on to graduate from Preston University in Pakistan with a master’s degree in business and management. Koofi originally wanted to become a physician, but chose instead to study political science and become a member of UNICEF. She worked closely with vulnerable groups such as Internally Displaced People (IDP) and Marginalized Women and Children – serving as a child protection officer from 2002 to 2004. Following the 2001 invasion of Afghanistan, Fawzai embarked on her political career and campaigned for the right to education for girls. In 2005, she was elected as a member of the Afghan parliament – following in the footsteps of her father whose 25 year political career came to an end when he was killed by the Mujahideen during the first Afghan war. 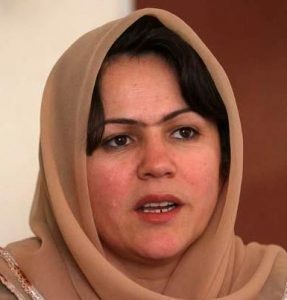 Re-elected in the parliamentary elections of 2010, Fawzia is currently serving as a Member of Parliament in Kabul and is the Vice President of the National Assembly. Earlier this year, she announced the intention to run for the presidency of Afghanistan in the 2014 elections. Since taking up office, Fawzia Koofi has championed the growing role of women in her country but has also fought to secure access to basic services and education – especially in rural areas and has seen her popularity grow in the Badakhshan district. Despite a growing number of supporters, there are those who do not approve of the changing face of Afghanistan as represented by her and there have been several attempts on her life. Fawzia believes that with the withdrawal of US troops starting next year, discussions with the Taliban will be needed to secure stability but holds that there are certain terms which are unconditional – namely the rights of women, respect for the constitution, and the denunciation of any ties to Al-Qaida. Fawzia has two daughters. Her husband died in 2003 shortly after being released from Taliban custody. Considering her level of education, she could have easily have carved out a comfortable career and gained respect for doing so well despite many obstacles. But instead, love for her country and her people have compelled her to fight. She is fighting to ensure that her beautiful country becomes the stable and prosperous place she knows it can be. Fawzia Koofi fights so that her daughters can fulfill their potential in their own country, and -just like us -need never know how courageous they might have been. Copyright ©2019 CFI.co – Capital Finance International unless otherwise noted.